It takes time to become as skilful a hunting unit as the South Pride. With many foiled hunts under their belt, the sub adults are finally at the age where they are adding massive value. Now, the experienced females are no longer alone in hunts and as a result the prides precision has been taken to new levels. Early last week the pride had been eyeing out the large herd of buffalo since the morning drive, however there was still no kink in the herd’s armour when we returned that afternoon. We sat with the pride, with the most action coming from a young male who spent the time snoring (along with my guests). Then a large buffalo bull wandered up the road towards us and the pride. Neither species paid much notice towards each other at first, until one of the invincible young male lions yawned and tried to sneak behind the bull. Within a few seconds the rest of the pride were observing what was going on, just in case they missed out. Suddenly the bull became startled, snorted and then turned and ran. The pride rose in union and began to steadily follow with renewed enthusiasm. At the bottom of the hill, the pride spotted a portion of the large herd of buffalo heading down to a watering hole for their afternoon drink. Gazing at the herd with killer intent, one could see how they were strategising a massive assault between their pride numbers and epxerience levels. The lead lionesses started to move into position. Not one of the sub adults moved. They watched their older females positioning and when they got the signal they followed suite. 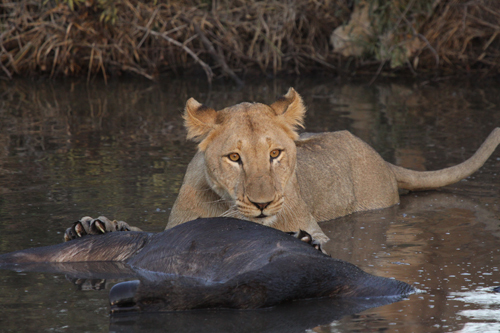 Looking at this video and reviewing the hunt in hindsight my thoughts are these: The oldest lioness had quickly assessed the buffalo’s assault and realised that with the bulls around there was little hope of luring the cow out of the water. She charged full speed at them and was forced to pull off a killer sidestep before they ran over a tree. 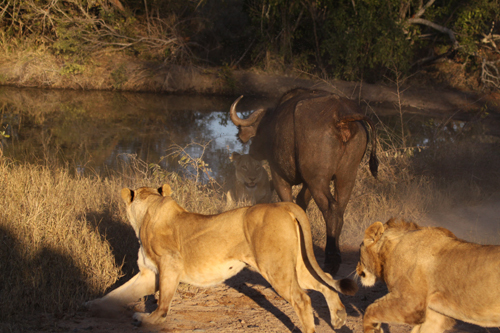 This brave move changed the bull’s attention and allowed the rest of the pride to focus in on the cow. The cow tried once more to charge at the lions in hope of catching up with the rest of the herd but the lions got their 2 inch claws into her face and neck. She retreated back into the water and dragged two of the younger pride members with her. The young lioness held on for dear life and after a battle of 15 or so minutes the cow gave up and the lions drowned her. Many experts suggest that lions are rather simple, lethargic creatures. However, after seeing such a precise assault, there is a lot more to the strategic thinking of these brutish animals than we give them credit for. Furthermore, the shifting dynamics with the dominant lion coalitions adds a current angle to the above thoughts on this pride and whether this has played a role in refining their skill as a unit. What do you think? Huge credit goes to my guest Anthony Cheng for filming the incredible episode as it unfolded, amidst the rushing and excitement of the hunt and for giving us the footage to use on the blog. Awesome footage Richard, well done. Thanks Johan, the full credit goes to Mike Miller who was guiding the vehicle & guests whilst the hunt occurred and also photographed it, as well as our guest Anthony Cheng who filmed the sequence. Fascinating stuff, and really great footage. Definitely made my morning tea break a bit more adrenaline fueled than usual- thank you! I’m not surprised Nix, its not the usual funny video that most people watch on their tea-breaks. 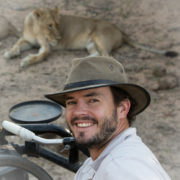 I agree that the footage is incredibly fascinating to watch and begin to dissect (along with the help of Mike’s write up) how this pride of lions functions together and has developed a hunting strategy, furthermore how the buffalo herd defends itself and the actions the individuals in the herd are prepared to take in order to rescue a cow in distress. Amazing, Thank you so much for sharing. I have wanted to come to South Africa for so long and thought I wanted to visit Djuma but now they are totally off my map and Londolozi will be the place I will go one day!!! You guys are so wonderful in sharing all these wonderful sightings and keeping us updated on the animals so well. It shows that you care and we appreciate it. Hi Sheryl, glad that you enjoyed the video and hopefully took something out of it. It is also good to hear that you are wanting to come to South Africa and particularly Londolozi when you do come, please feel free to connect anytime that you want to know more about organising a stay with us. 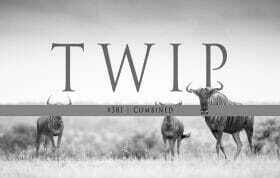 We will definitely continue to put animals and other Londolozi updates on the blog. Look forward to staying in touch. It is a very Fascinating Video,But there are some Questions regarding lion Dynamics has the lone Young Tsalala male been seen again and is he alive and in the last weekly sightings it was reported that Tsalala females were mating with Majingilanes have Tsalalas accepted Majingis as their Leaders because last month Tsalala Pride had gone West and had been seen with Mapogo Coalition ???? Hi Ravi, the lone young Tsalala male was seen briefly with the Tsalala pride a few weeks ago, from then he has not been seen. As far as we know he is still alive. It is doubtful that the Tsalala pride have ceded full control to the Majingilanes. Interestingly enough, some of the rangers believe that the two females who were mating with the Majingilanes are playing a similar tactic to what the Sparta pride used at the beginning of the year. Understanding that there is no stable dominant male, one or two females lure the males away to mate with them, which gives the rest of the pride a chance to move away from the drama until it calms down. As we saw in the middle of August, the Sparta pride is beginning to introduce the news cubs (The results of luring away and mating with the Mapogos in early 2010) to the rest of the pride. To link back to the Tsalala pride, this is not to say that they are now subservient to the Majingilanes just because they are mating with them. The two females could possibly be protecting the rest of the pride who are of Mapogo heritage by creating a diversion. There are still many questions that are being asked and as a rule of thumb in times like these, never assume that traditional lion behavior, social structure and consistent actions are going to take place. As I have mentioned many times before, anything can happen with so many different variables in play. Does that begin to answer your question? My family of 5 will be joining you next June/July at Pioneer Camp. Your blog is giving us so much to look forward to. We can’t wait to be back on safari again. Awesome video Rich! thanks for sharing! 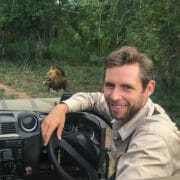 Hey Laura, I’m glad you are preparing yourself for your safari with us by keeping up to date with the blog. Hopefully we are giving lots of things to look forward to! June/July is such a great time of the year to come to bush, this last winter has been not short of spectacular game viewing (as you can see from the story above). Keep in touch. I get the impression that the Mapogos are gonna be picked off one at a time or driven out in pairs or they might just surprise everyone and kill a Majingilane. I’d sure love to see Makulu Mapogo at the top for a few more years but then again he looks pretty old and those Majins are obviously raging young testosterone. Yeah lion dynamics are absolutely fascinating especially large male coalitions. Jeez six once upon a time? Must’ve been something of a sight to the people there. Any chances of a four on four? Definitely a chance of four on four, it just depends how much pressure is placed on both parties towards a confrontation. If the Majingilanes are unchallenged in the East, they may continue to reside there and leave the Mapogos alone in the west. However you also need to take into account the different prides in the Sabi Sands, the offspring of the Mapogos and the independent dynamics of each male lion wanting to be in control. Oh man, this was an exciting video, I appreciate the videography of this exciting event. I have been trying to follow the movements of the lion prides and this was certainly fantastic. I’m disabled and probably will never get to Africa and it is wonderful to see the animals in a fight for survival as it happens. Thanks to all that were involved in the making of this. Glad that you enjoyed it Debra and appreciate the videography. It was put together to try and relive the excitement of being on the back of a landrover whilst following the frantic rush of lions hunting buffalo. As I am sure you know, there is a large resource for understanding the movements of lion prides that move throughout Londolozi and other areas of the Sabi Sands Game Reserve, You can check out all the Lion Warfare Updates on the blog. Many of them will have videos for you to view as well. I certainly hope that you are able to come on Safari to Africa one day despite your disability and that you continue to gain enjoyment from following our blog. What an awesome sight. 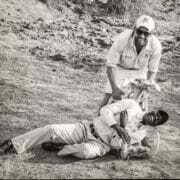 We safari fanatics would do any thing, pay any price to watch this drama live. last year in Masai Mara, I captured og video a lone buffalo chasing a lion and a lioness away. The buff charged the two half asleep predators. 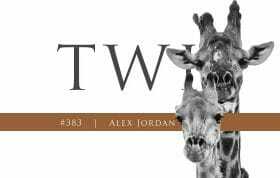 They sprang to life as if electrified and ran away with tails between the legs. That’s awesome to have been able to see that. I can understand the feeling of doing anything to watch drama like this in person. It truly is sensational and the best form of escapism imaginable. Your video sounds terrific, is there a link we can click through to watch it? Thanks for your thoughts and comments. Really awesome video. It is simply question of luck to capture such moments on video, one has to be at the right place at the right time. Last year I was lucky to video a lone buffalo charghing a pair of lion and a lioness in Masai Mara., Kenya. The pair were resting, half awake, half asleep when the Buffalo approached near them while foraging for grass. I sat in the landcruiser filming. Imagine a triangle and put us at three points. The Buffalo kept looking at us and the lions, confused which one is more dangerous. Finally he made up his mind. better to deal with the devil you know than the one you don’t. He charged the pair of lions. They sprang up like a spring and ran away with tails between the legs. The Buffalo followed them and charged again second time. I have got the video but it is in HD format and won’t play in here.